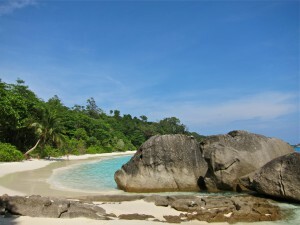 The Similans are intrusive granitoids and are part of a north trending belt known as the “western Belt”. They are characterized by Cretaceous plutons of mixed I (subduction of oceanic lithosphere) and S (continent – continent or continentmagmatic arc collision) type granites. The granites in this belt occur as small isolated plutons and are characterized by multiple intrusions of porphyritic biotite-muscovite granite (with K-feldspar megacrysts). They occur predominantly along the Burmese-Thai border and along the western part of the Southern Thai peninsular, including Phuket island. Tin-tungsten mineralization is common in the S-type granite of this belt and has been mined extensively. 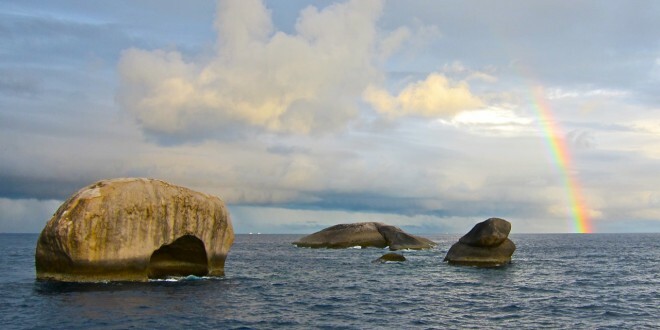 It is believed that the granite intrusions are possibly related to Mesozoic subduction from the west between the Indian and Shan-Thai terrain. The Shan-Thai terrain had its origins on the northwestern margin of Gondwanaland in the Southern hemisphere during the lower Paleozoic. The Shan-Thai comprised eastern Burma, western Thailand, Peninsular Malaysia and northern Sumatra. It is thought that the Shan-Thai terrain remained attached or close to Australian Gondwanaland until the early Permian as indicated by early Permian glaciomarine deposits (the pebbly mudstones of the Kang Krachan Formation or the Phuket group), coolwater faunas and fauna with northwest Australian affinities and by middle-late Permian and early Triassic fauna showing affinities to Cathaysialand and to northern tethys province type. The rifting and displacement in the Paleotethys ocean resulted in extensive depositions of deep marine facies. In the late Permian the Shan-Thai collided with Cathaysialand and the suturing of Indochina was largely completed by the late Triassic. The distinctive Permian karstic limestone of the South Western Thailand are known as the Ratburi Group. The limestones comprise of a transgressive regressive carbonate platform sequence, interpreted as having been deposited in progressively shallow-water environments. This ranges from open shoal, marginal platform, to shallow, open, inner platform and protected lagoon. Brachiopods, corals, crinolids and bryzoas are the typical fauna associated with the Ratburi Formation. Complex synclinal structures have been found in the Paleozoic rock in particular the Phuket Group. The trendnd of syncline / anti cline varies from N-S to NE-SW. Limestones clearly show folding structures and no rock younger than the Permian Limestone has been found ontop of these synclines (except colluvium). Faulting occurs in four directions which are N-S, NE-SW, E-N and NW-SE. The towerlike limestone hills of Southern Thailand are of the Rathuri Group. The limestone formations are usually honeycombed by caves and grooves. Other karstic features are isolated towers, dead-end valleys and subterrabean creeks. The formation of the limestone hills in southern Thailand is related to the structural setting. The most recent theories on the morphological development of karstic regions invoke the ratio between rates of vertical and lateral erosion. In this light, precipitous limestone hills are indicative of extremely rapid vertical erosion associated with low water tables and abundance of vertical joint planes.